The Ordnance Survey six-inch to the mile (or 1:10,560) County Series is the most comprehensive, topographic mapping of all of Scotland from the 1890s to the 1940s. The series is made up of 7,486 map sheets, including 1,136 full sheets and 6,332 quarter sheets. It was revised for the whole country from 1892-1907, and then updated regularly for urban or rapidly changing areas from 1914 to the 1940s. The maps are immensely valuable for local and family history, allowing most features in the landscape to be shown. The more detailed 25 inch to the mile (or 1:2,500) maps allow specific features to be seen more clearly in urban areas, as well as greater detail for buildings and railways. However, most topographic features on the 25 inch to the mile maps are in fact also shown on the six-inch to the mile maps. This website allows all out-of-copyright OS six-inch to the mile County Series maps of Scotland to be viewed. The Ordnance Survey six-inch maps record most man-made and natural features in the landscape. Every road, railway, field, fence, wall, stream and building is shown, even including smaller features such as letter boxes, bollards on quaysides, mile posts, and flag-staffs. Uncultivated land is distinguished by different symbols for types of woodland (e.g., birch, fir, mixed, furze, osier, brushwood), as well as marsh, bog, and rough grassland. All public boundaries and administrative boundaries (including civil parish, burgh, and county boundaries) are clearly shown, apart from certain boundaries within towns. The extensive revisions to boundaries through the Local Government Acts of 1889-1894 can be clearly seen by comparison with the boundaries shown on the first edition six-inch maps. Spot heights in feet above mean sea level at Liverpool (and then Newlyn from 1921) are shown along roads, railways, etc., and the six-inch maps are the most detailed scale at which contours are shown. 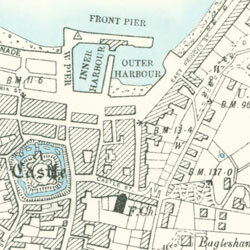 Further information on map content from the Ordnance Survey six-inch first edition maps. Following the recommendations of the Ordnance Survey Dorington Committee in 1893, all counties were to be revised every twenty years. This was largely followed in practice until the First World War. From 1892 to 1907 all Scottish counties were revised once, and a further fourteen were revised again up to 1914. Three-quarters of all the 2nd and later edition six-inch maps were published between 1892 and 1908. However, following the First World War, economies forced the suspension of such regular revision for mountainous and sparsely-populated areas. Officially, these counties that were previously on a twenty-year revision cycle were moved to a forty-year revision cycle. This particularly affected most of the Highlands and Islands, where rural mapping in practice was often not revised until the 1970s. For these mountainous and sparsely-populated rural areas, there is therefore only one six-inch revision of maps from the 1890s to the 1960s. In contrast, urban districts and those areas undergoing considerable change were revised more regularly, especially from the 1930s. The larger urban areas of Edinburgh, Dundee, Glasgow, and several towns in the Central Belt often have four or more revisions between the 1890s and the 1940s. Although the official policy was to publish new National Grid sheets from 1945, updated County Series maps continued to be issued for selected parts of the Highlands until the 1960s when they were eventually overhauled as part of the new National Grid survey. We show those on this website that are out-of-copyright, published over 50 years ago. View list of Scottish counties, with their changes of meridian, and dates of survey and publication.